Do you have a question about healthy cooking, modifying a recipe, or need some creative but healthy substitutions? Here's your place to ask Stella! Question: " On the protein powder that you used in your recipes - I am not asking for an endorsement of it but I can't seem to find one locally that had as much protein of the one you use. I am willing to shop the internet but the selection is quite overwhelming. " 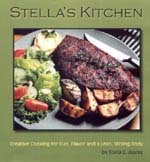 Question: "Stella, I would like some great recipes for ground turkey. I do not eat bread." What Happens to Protein When You Cook It? What Can I do if my Chicken Stir Fry is Too Dry? Can I make a Healthier Tartar Sauce? Are there alternatives to low carb bake mixes? Question: " I think that you will be interested in the attached article about mercury in seafood, including canned tuna. It's on pages 11 and 12 of the Spring 2003 issue of Eating Well magazine. Please let me know what you think about its recommendations." Still Got a Question? Submit your questions here.